Cave of Forgotten Dreams is probably not an essential Werner Herzog film, and I sympathize with those (like Bill Benzon) who’d much rather just see the pictures and do without Herzog’s prattling on or the “banshee muzak,” as Bill calls it. In both the prattling and especially the banshee muzak (which is pretty good, for banshees, and for muzak) it’s very much of a piece with Herzog’s sci-fi-ish and underwater scenes like those in Wild Blue Yonder and Encounters at the End of the World. In its stylized interviews with quirky scientists it’s also consistent with Encounters, though perhaps more sober. It’s good, thoughtful filmmaking, well done under the circumstances (with severe restrictions on filming within the cave), and unconventional for a History Channel financed documentary. But it’s a fairly conventional documentary for Herzog. 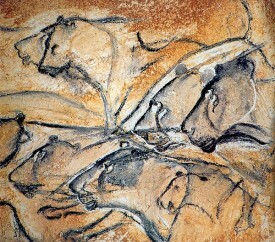 Seeing the cave paintings, however, is essential, and Herzog is a good enough guide to them. 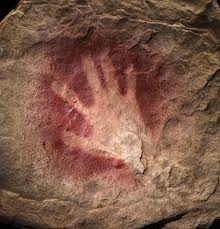 They are, after all, the oldest known cave paintings in the world, dated to about 32,000 years ago and preserved by a fallen rock face for some two-thirds of that time until their rediscovery in 1994. This film is one of the few, and best, opportunities to really see them. I should add that I didn’t see the film in 3-D, since that wasn’t available in my area, so if you have that option, please read some of the better reviews that describe it with that aesthetic choice in mind — Marianne Shanneen’s review in Brooklyn Rail is particularly good, and the reviews at Tativille, Mubi, Middle Savagery and elsewhere give me the sense I may have missed the real distinctiveness of the film in my local theater’s cheapo 2-D rendition. Herzog here is in his full-Romantic mode (Tim is certainly right about this), with barely a hint of Herzog-the-misanthropic/posthumanist-ironist — well, not until the final minutes, when he pulls out a stunning “Postscript” that I hesitate to describe lest I spoil the experience for anyone yet to see the film. But here I go spoiling it. (Take heed and read no further until you’ve seen it, if you’re that kind of viewer). In other words, where the whole film had been about the adventure of interpretation — how do we cross those thirty millennia, fuse those chasmically parted Gadamerian horizons, make sense of those lines drawn by Cro Magnons at a time when mammoths and Neanderthals roamed Europe? — now the film is suddenly taking the floor out from under our reconstructions and suggesting the utter futility of the entire interpretive enterprise. Herzog clearly wants to be a romantic artist, or at least their contemporary spokesperson. He prominently cites an archaeologist quoting an ethnographer quoting (in turn) an Aboriginal Australian cave painter saying that “I am not painting. It’s the hand of Spirit that paints” — and then he shows us a camera, suggesting that “I am not filming either.” The implicit question is: how might we become so attuned to the artistic sensibility of those painters 30 millennia ago that the same spirit could flow through us? But even if it’s clunky in doing this, the film does a good job at conveying the quest for meaning (thirdness, realization) — the effort to make sense across the abysses that haunt us at every step if we dare look — at the same time as it demonstrates the elusiveness of the thing being interpreted. In the ceaseless production of thirdness (meaning, in Peirce’s sense), firstness ever recedes. Oh, it is there, touching us, whispering to us, staring us in the face from out of the darkness, but we can’t grab it no matter how hard we try. The film, to put it into process-relational terms, is ultimately about process: the process of turning a world into images — in fact, into an entire, immersive virtual reality, a prehistoric Cinema-1 to our technological Cinema-2; the process of the preservation of those images over time (rocks slamming shut the temporality that air and microorganisms would otherwise have brought to them); the process of their discovery and impending disintegration (just as other cave paintings have been disintegrating from contact with the footsteps, carbon exhalations, and camera flashes of modern humans, and just as films themselves are fated to disintegrate); the process of our interpretive reimagination of those image-worlds; and the process by which the other end of each of these processes always escapes from us, fleeing elusively like the tail of the dog that can never get caught in its teeth no matter how much it swings around its own axis. We are the snake that fails to entwine itself in its Ouroboric circle. And that’s just fine — in fact, it’s cause for printing our hands into the walls of time. The question is whether it’s in the cave or, as Plato suggested, outside it (where those albino crocodiles swim), that we may find inklings of ourselves. Herzog says it’s inside, and I think I’m with him. Came clueless, left worried. Thanks for the post. Sometimes I wonder whether the world is being run by smart people who are putting us on or by imbeciles who really mean it. I just watched the documentary and thought it was decently done, but there were times I wished Herzog would be silent could I could concentrate on the paintings, no offense to the man meant but the paints were the whole reason I was watching. The interviews with the scientists were pretty good even with the odd notes.